How did you take to music? Ours is a traditional musical family. My mother Tiruvarur P.R. Anandavalli hails from Tirukkannamangai village, and my father belongs to Madurai where he was a businessman. When I was barely 2-1/2 years old my father passed away. My maternal great grandfather, Ramdas Nainakkarar was a renowned nagaswara vidwan and he followed the Vaishnava culture and tradition as he played regularly at the Tirukkannamangai Perumal Temple. 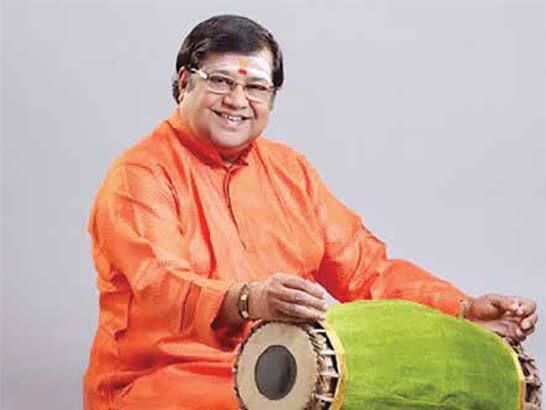 He was also the nagaswara vidwan for the 18 Vatima villages around Semmangudi. With a scarcity of good teachers in Tirukkannamangai, my mother went to Tiruvarur to learn vocal music from Tiruvarur Sethuraman. She also learnt from Madurai Srirangam Iyengar, Tiruvarur Namachivayam and T.M. Thiyagarajan (who was also related to us). During this time we migrated to Tiruvarur and settled there; that is why I have Tiruvarur as the prefix to my name and not Tirukkannamangai. Our house reverberated with music throughout the day as musicians including nagaswara vidwans visited us. I was more interested in music than school, and did not focus on my studies even as a young boy. They would lock me in a room and my sister would scold me to study, but I would somehow open the door and try to listen to the great music of the vidwans. As my mother and sister were of the opinion that mridangam playing could not be taken up as a full-time profession, they wanted me to obtain a degree and a stable job while continuing to play the mridangam, but God willed otherwise. What was the impact of such listening on your mridangam playing? I was drawn to laya vadyas like the tavil and mridangam and I used to listen to my uncle play the mridangam. I was also adept at singing kritis thanks to my constant exposure to my mother’s singing during practice sessions, concerts and classes. As a five-year-old, I am told, I used to play the mridangam pretty well for Sree Subramanyaya namaste and some other kritis although I did not then have any knowledge of tala or its intricacies like arudi or teermanam. Tell us about your guru and your early concerts. I learnt to play the proper way from my maternal uncle Tiruvarur Krishnamurthy, a disciple of Kunju Iyer—from the basics till the advanced level. I belong to the Tanjavur style propounded by Tanjavur Vaidyanatha Iyer. I started learning at the age of six. I had no proper arangetram but often played along with my uncle. By the time I was nine years old, I started playing in concerts which my uncle could not attend. I wish to recall an incident from that period.